Trump My Record, under jockey Eddie Sanchez, setting the fastest time for the $459,700 Sam Houston Futurity(G2) at Sam Houston Race Park Saturday night. HOUSTON, TX—APRIL 13, 2019— Sam Houston Race Park hosted 15 trials for the richest race of the 2019 Quarter Horse Meeting, the $459,700 Sam Houston Futurity (G2). The fifth trial of the card produced the fastest qualifier when Trump My Record returned to the winner's circle with an impressive gate-to-wire victory under rider Eddie Sanchez, covering 330 yards in :16.566 seconds. The track was fast and he earned a 103 speed index assisted by a 10 mph tail wind. Bed in Texas by Fulton Quien Sabe Ranches LP, the son of first-crop sire Apollitical Blood out of the Pyc Paint Your Wagon mare Breck N Records is owned by Cruz E. Nava and trained by his brother-in-law Arturo Davila III. Purchased for just $10,700 at the TQHA Yearling Sale, he was victorious in the $254,070 Harrah's Entertainment Futurity (G3) on March 20 at Louisiana Downs after setting the fastest qualifying time in trials on March 2. 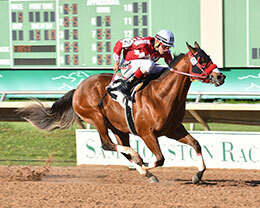 Nava and Davila considered supplementing their futurity winner to the Heritage Place Futurity at Remington Park, but decided to run in Texas and paid the $7,500 supplement for the Sam Houston Futurity. The wind picked up considerably toward the end of the card, but the conditions in the early trials were ideal and Trump My Record did not disappoint as the heavy favorite, besting Rusty Blood GL by a margin of 1 ½ lengths. "He keeps trumping his own record," stated Davila. "We are fortunate that he is sound and may just be our horse of a lifetime. From here, we will just take him home to our farm and keep him happy until the final." Nava, a resident of Lytle Texas, also owned Shesa Diamond Diva, who ran second in the 2017 LQHBA Louisiana Million, earning $386,375 in 11 starts. As much as he has enjoyed the early success of Trump My Record, he admits that he has taken some flack on the name of his futurity champion. "We did not name him," Nava said. "But I don't believe in changing a name of a racehorse." Trump My Record ($2.80) is undefeated in his three starts and has banked $118,652 this year. It was big night for Davila and Sanchez who also qualified Pa Cha Ching for owner Pat Allen and Arturo Ibarra's Mystic Lake, who set the tenth fastest time of :16.839. Pa Cha Ching, a son of Tempting Dash, won the ninth trial in :16.616, which was the second-fastest clocking of the night. Allen owns the dam, Toole N Round, who won the TQHA Oaks and TQHA Sires' Cup Stakes at Sam Houston Race Park in 2006 and 2007. First-crop sire Apollitical Blood has sired a second qualifier, Rusty Blood Gl who finished second in trial 5 tio get the seventh fastest time. Also a first-crop sire, champion Kiss My Hocks sired sixth fastest qualifier Doc Hockaday. CLICK HERE for the ten fastest qualifiers who will return for the final of the Sam Houston Futurity on Friday, May 3 with the winner earning $183,880. The winner will add their name to a distinguished list of past champions, including 2014 AQHA Champion 2-year-old colt, Kiss My Hocks; Azoom; Snowy Alibi, Ivan James, Especially Tres and This Is An Eagle. The second 10 fastest qualifiers from tonight's trial races are preferred invites to the $50,000 Sam Houston Juvenile Invitational. For a list of those horses CLICK HERE. Sam Houston Race Park is Houston's premier racing and entertainment facility, located just 15 miles from downtown Houston. The Park offers a variety of attractions including our Suite Level featuring luxurious suites overlooking the race track and accommodating groups from 20 to 300 people, The Pavilion Centre, and award-winning dining options at the Winner's Circle Restaurant and the Jockey Club. For more information on upcoming shows, events and tickets, please visit shrp.com.